To brighten up simple salads, shop-bought herbal teas, cakes and the same old jam, look no further than the garden for inspiration, says Gardening Which? magazine today. 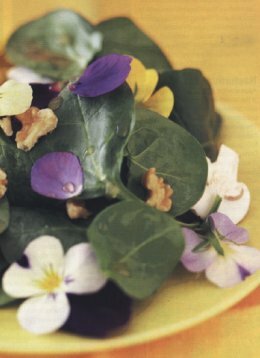 Most cooks have heard of flowery favourites such as saffron, camomile tea and elderflower cordial, but there are over 100 different plants in the UK that have edible flowers. Borage - Borage has a cucumber-like taste which is slightly sweet. It can be added to both sweet and savoury food, but is used to best effect when frozen in ice cubes and floated in jugs of Pimm’s. Basil - Use the flowers of the ‘Lemon’ variety as you would the leaves – in pasta dishes or salads for a zesty flavour. Pink - A sweet, clove-like taste, the Pinks plants have bright and attractive petals ideal for decorating cakes, puddings, fruit salads and ice creams, and make lovely pot plants! Sweet Rocket - With fragrant, purple flowers, Sweet Rocket is mild enough to add to salads and to decorate desserts. It is a robust plant well worth a place in the perennial border too. Pot marigold - Yellower varieties of pot marigold will give saffron-like colour to rice or soup, while the ‘Coffee Cream’ is good for adding to savoury dishes. Violet - The testers’ favourite, ‘Brush Stokes’ has small crimson, yellow and white flowers – they’re excellent for decoration as they look pretty but won’t interfere with any other flavours. Alternatively dry violets to flavour tea. Ceri Thomas, Editor, Gardening Which? “Keen cooks and gardeners alike have got used to popping out to their garden to get some mint or thyme to add to their dinner, but everyone should consider adding flowers to their ingredients both for flavouring and decoration.